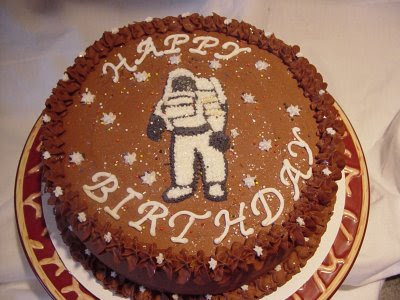 The U.S. space agency celebrated its first half century on July 29 -- the same day I marked my 25th anniversary as a journalist. In fact the oldest, yellowing article in my "clip file" was a story for Congressional Quarterly's Editorial Research Reports (now the CQ Researcher) on NASA's first 25 years. I was 15 at the time, but my mother was the managing editor, so I had an in. And I was thrilled when the article was reprinted in the Kansas City Star -- the newspaper where Ernest Hemingway began his writing career at age 18. I've had some success in journalism since then, although hardly the Hemmingway-like career I once daydreamed about. Then again, the future rarely lives up to its advance billing. Just ask NASA. In the late 1960s, the space agency's heyday, rocket pioneer Wernher von Braun was pushing bold plans for manned missions to Mars. And a 1969 task force led by Vice President Sprio Agnew concluded that NASA had "the demonstrated organizational competence and technology base, by virtue of the Apollo success and other achievements, to carry out a successful program to land man on Mars within 15 years." In other words, by 1984. But by then, when Van Braun and others had imagined astronauts planting flags in the red dust of another planet, NASA's vision had turned far more myopic. Or was it just down to Earth? Astronomers eagerly awaited the launch of the Hubble Space Telescope, a wait NASA had to extend seven more years after the 1986 Challenger accident grounded the shuttle fleet. Manufacturing defects in Hubble's main mirror were not detected until after its much-delayed deployment by shuttle Discovery in 1990, so its productive life did not begin until after a repair mission a few years later. NASA's most far-reaching missions at the time involved long-range robotic space probes. Pioneer 10 had just become the first man-made object to pass the orbit of Pluto -- then still considered the solar system's most distant planet. "How space dollars should be spent is [an] area of disagreement. A survey conducted by the National Space Institute, a private, Washington-based group that promotes space activities, found that its members wanted to see a continuously manned space station in orbit by 1990, a goal shared by many NASA officials. Presidential science adviser George Keyworth at first labeled the space station idea an 'unfortunate step backwards.' But support for it is stronger in Congress than the in the White House , and the [Reagan] administration has indicated that it might be willing to back the idea." As it turned out, the first component of what became the International Space Station did not make it into orbit until December 1998. By then, the Soviet-Russian space station Mir was nearing the end of a decade of continuous crew operations, including extended visits by seven U.S. astronauts. Continuous operations on the NASA-run space station began in 2000. Considering the prospects for NASA's current plans for returning astronauts to the moon by 2020 and, from there, setting out to explore Mars, one can't help but feel the same gravitational forces that have held back many of the agency's boldest plans in the past -- lukewarm public support, political realities and federal budget limitations. My July 21 CQ Weekly column looked at the kind of work NASA's next group of astronauts can expect to be doing, especially after the shuttle fleet is retired in 2010. That's when construction of the International Space Station is scheduled to be completed. At that point U.S. astronauts become "infrequent flyers" -- making fewer, but longer-term space station visits. Those astronauts will be dependent on rides aboard Russia's three-person Soviet-era Soyuz spacecraft to reach the station, at least until NASA's next-generation Orion Crew Exploration Vehicle and its Ares I launcher begin flying, possibly by 2015. NASA also has considered using modified versions of commercial spacecraft being developed to deliver cargo to the space station as an alternate way to transport crews too. Perhaps by the time NASA turns 75, some of the agency's newest astronauts will already have been among the first to take "small steps" onto the surface of Mars, claiming their places in the history books -- or whatever it is we'll be reading or watching in 2033. But history suggests that NASA's plans for exploring the solar system will involve many unexpected course corrections. In that sense, the space agency's journey is much like our own. The airline industry's altimeter indicates that it is approaching the bottom line at rapid speed. Are there any clever ideas for upgrading the experience for passengers while helping the airlines regain financial altitude? "There is no way the airlines can continue to loft that much metal across the skies at the rate of oil depletion we are witnessing. The only way to keep air travel viable is to lessen the fuel required, and the only way to do that is with airships, or dirigibles. They are slower, but use far less energy to carry a greater load." 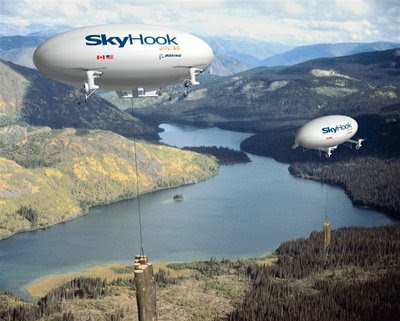 As it happens, Boeing recently announced plans to begin building a huge new airship for SkyHook International Inc., a privately held Canadian company based in Calgary, Alberta. But the helium-filled Jess Heavy Lifter, or JHL-40, is for hauling cargo rather than passengers. The proposed airship would be 300 feet long and 210 feet wide, with four helicopter engines to help it lift 40 tons of cargo (80,000 pounds) and carry it more than 200 miles without needing to refuel. SkyHook's Web page includes an information sheet, as well as numerous annotated conceptual illustrations (like the one above) showing the ship lifting tractors and lumber, helping erect tall electrical transmission towers and fighting forest fires. "SkyHook services will first be offered in remote regions of the world where conventional transportation infrastructure doesn't already exist or where building such infrastructure is difficult, costly and environmentally unfavourable," the site says. The vehicle is designed to be operated by a crew of three with room for two complete crews for long-distance hauls -- but "no passengers, essential crew only." Another German company, Zeppelin NT, has been building and operating passenger airships for tourist excursions. The Federal Aviation Administration recently approved flying Zeppelin NT's cigar-shaped craft over the United States and U.S. corporate partner Airship Ventures hopes to begin operating in the San Francisco area soon. The timetable for the Boeing-SkyHook venture is a bit more up in the air. Boeing plans to build two production prototypes of the JHL-40 at its Rotorcraft Systems facility near Philadelphia. Company officials told Aviation Week they expected their airships to be ready to fly sometime in late 2012. Robert Breidenthal, a professor of aeronautics and astronautics at the University of Washington, shared some thoughts with Xconomy Seattle on obstacles that Boeing and SkyHook will face. Among them: dealing with turbulence and aerodynamic control. Another challenge, Breidenthal said, is the price of helium -- which, it just so happens, is going up. 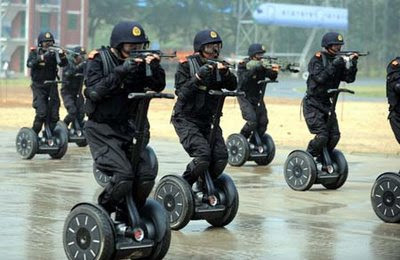 When inventor Dean Kamen unveiled his world-changing "magic sneakers," better known as the Segway, this may not have been the image he had in mind. The photo above from China's official Xinhua news agency shows police in a July 2 anti-terrorism drill in Jinan, the capital of Shandong province. Kamen, a National Medal of Technology winner for his inventive medical equipment, first revealed his heavily hyped secret personal-transportation gizmo (code named "Ginger") to some mild disappointment in December 2001. "It is not a hovercraft, a helicopter backpack or a teleportation pod," began a New York Times article at the time, capturing some of the overwrought speculation that Kamen had skillfully engineered over the proceeding months. What followed was a perfect laboratory demonstration of Newtonian marketing theory: What is hyped must then be un-hyped. "It would be premature to call the most talked about scooter in the history of humankind a huge bust," Gary Rivlin wrote 15 months later, under a Wired magazine headline that seemed to say just the opposite. "Segway's Breakdown," the headline read. "Inventor Dean Kamen promised that his superscooter would change the world. Then reality hit -- hard." The manufacturer also has long had its eye on military applications, including Segway-derived robots. But we're still a long way from a police-carrying jet pack. I'm holding out for one of those.